A new report on national security that the Congress Party released on Sunday in Delhi provides an insight into how key relationships with China and Pakistan will be managed if a Congress-led government comes to power next month. “Future strategic rivalry between China and India is a certainty, and a successful trading partnership cannot overcome the reality of this competition,” says the report, titled “India’s National Security Strategy” and authoredby Lieutenant General DS Hooda, former army commander in Jammu & Kashmir (J&K). In fact, Beijing has steadfastly resisted defining the LAC. It has dragged its feet even on the preliminary step of exchanging maps marked with each side’s perception of the LAC’s alignment. This would constitute a major reversal of New Delhi’s current unwillingness to participate in, or even discuss, the Belt and Road Initiative with Beijing. However, discussing the report after its release, Congress leader P Chidambaram dismissed the “drum beating and chest thumping” that had come to characterize all discussions about Pakistan. “War is not an option. Anyone who says otherwise is misleading the Indian people. We build strong armies not to win a war but to avoid a war,” he said. Asked what changes he would propose, Chidambaram admitted “We have tried pretty much everything, but that does not mean we do not go on trying.” He said the two sides had already come close to solutions on the Sir Creek and Siachen disputes, while the “most difficult” J&K dispute could be tackled at the end. On Afghanistan, the Congress will continue New Delhi’s unbending opposition to the Taliban, even though the US and Russia are now in dialogue with the insurgent group. “India has always supported an Afghan-led and Afghan-owned process of peace and reconciliation… [but] must not compromise on its position and get drawn into supporting the Taliban,” says Hooda’s report. To tackled the J&K insurgency, Hooda argued for simultaneously addressing its two distinct “centres of gravity”: the Pakistan sponsored dimension and internal Kashmiri alienation. “We have had separate military and political strategies. We need a combined and comprehensive politico-military strategy. There must be a well-crafted information campaign [to overcome the] feeling in Kashmir that the state is at war with its own people,” said Hooda. 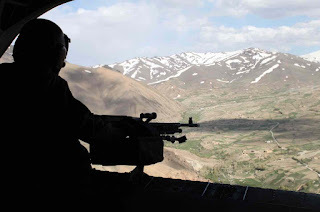 In Kargil, in 1999, the operations to evict Pakistani infiltrators found the military short of artillery ammunition and precision-guided aircraft bombs. Today, after the Indian Air Force’s (IAF’s) strike on Balakot on February 26 and retaliation the next day by Pakistani fighters, the military finds itself badly short of air defence missiles and surface-to-surface rockets. In 1999, the ministry of defence (MoD) obtained bombs and ammunition from Israel on an emergency basis. This time round, the MoD has asked Russia to urgently replenish India’s firepower. India’s emergency requests on Russia include launchers and missiles for the Igla-S “very short range air defence system” (VSHORADS), rockets for SMERCH multi-barrel, surface-to-surface rocket launchers and Mango armour-piercing ammunition for India’s fleet of T-90 tanks, say sources in New Delhi and Moscow. The army has told the MoD restocking up is essential in case the current truce with Pakistan breaks down, or there is another terrorist strike like the Valentine Day suicide bombing of a Central Reserve Police Force convoy that killed 40 troopers. While that led to a limited IAF strike on a Jaish-e-Mohammed training camp in Balakot, inside Pakistan, another terrorist provocation would demand heavier Indian retaliation. While the Igla-S is a defensive weapon, the requests for SMERCH rockets and Mango armour-piercing ammunition indicates the military is preparing for ground offensives as well. Moscow is cooperating to deliver India’s orders on urgent priority. Russian negotiating teams, which have already engaged in discussions with the MoD, will be travelling shortly to New Delhi with techno-commercial offers for meeting Indian demands. Business Standard learns the emergency sourcing from Moscow will be paid for under financial powers delegated to the vice chiefs of the three services. Last November, the MoD increased the vice chiefs’ financial powers to Rs 500 crore for each transaction. The current purchases would involve multiple transactions, but the exact costs are still being negotiated with the Russians. Given the threat from Pakistani fighters, which attacked Indian military installations in numbers on February 27 and shot down an Indian MiG-21 Bison, the most significant purchase is the Igla-S VSHORADS. This portable air defence system is carried and operated by a two-man crew and fires missiles to shoot down enemy fighters at ranges of up to eight kilometres. Last November, the MoD announced it had selected the Igla-S in the hotly contested VSHORADS tender for 5,175 missiles and 800 launchers for all three services. An MoD committee has been negotiating costs with Rosoboronexport (RoE), Russia’s defence export body, but a contract has not been finalised. 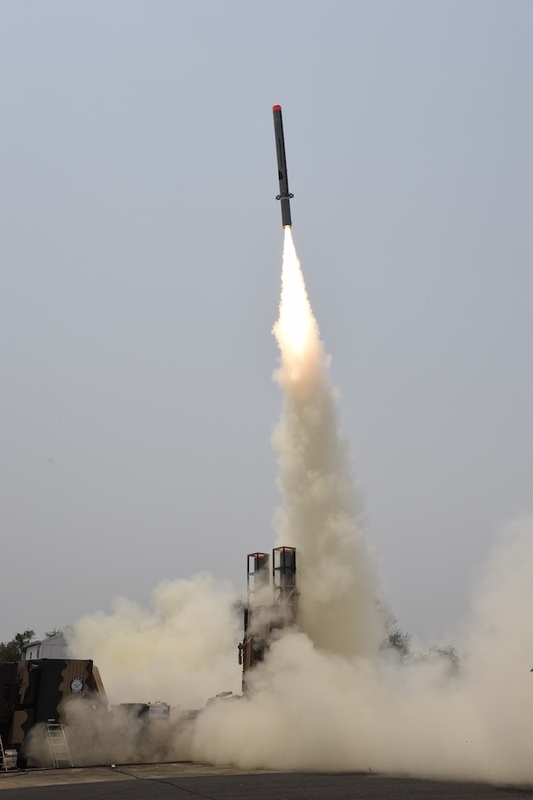 Other vendors in the VSHORADS contest, particularly Swedish firm Saab, are hotly contesting the selection of the Igla-S, which they allege failed user trials. However, with the Igla-S now meeting emergency Indian requirements, the larger VSHORADS tender seems settled in ROE’s favour. Moscow is obtaining further goodwill by offering to refurbish the army’s obsolescent Igla-M launchers to enable them to launch the far more capable Igla-S missiles. “The flight was flawless and its success is an important step in the IJT programme”, announced HAL on Thursday. The success of the IJT – also called the Hindustan Jet Trainer – 36, or the Sitara – is crucial for both HAL and the Indian Air Force (IAF). For a cash-strapped HAL, building 73 IJTs the IAF needs represents business worth Rs 5,000 crore. For the IAF, the IJT would seemlessly replace a fleet of obsolescent Kiran Mark I and II trainers that are already on borrowed time. Without that, the IAF will have no aircraft for the intermediate stage of flying training. Late last year, the IAF decided that its rookie pilots, after completing “Stage-1” flying training on the Pilatus PC-7 Mark II basic trainer, would graduate directly to “Stage-3” training on the HAL-built Hawk advanced jet trainer (AJT). The IAF realises that “two-stage” training places unrealistic demands on trainee pilots The successful development and quick manufacture of the IJT would allow its time tested “three-stage” training to continue. That would also mean HAL aircraft are used in all three stages of IAF flight training. 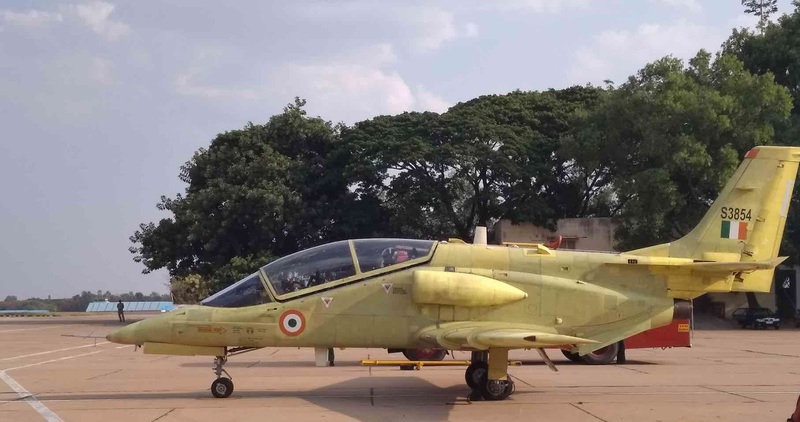 HAL’s basic trainer, the Hindustan Turbo Trainer – 40 (HTT-40), is doing well in flight testing and is expected to join the fleet alongside the Pilatus PC-7 Mark II trainer. HAL has also manufactured the Hawk AJT fleet in Bengaluru, under licence from BAE Systems. However, the IJT’s development trajectory has been troublesome. In 2016, flight testing was put on hold after the trainer experienced difficulty in pulling out of spins – something that inexperienced pilots cannot be exposed to. In December, the IAF requested to close down the IJT project. However HAL asked the defence ministry (MoD) for time to rescue the programme. HAL offered to return the IAF the Rs 3,000 crore it had paid towards an order for 73 IJTs. HAL’s board allocated Rs 50 crore in company funds to take forward the IJT’s development, supplementing the Rs 600-700 crore it had already spent. Senior HAL sources tell Business Standard the IJT has undergone an extensive two-year redesign process, guided by design consultancy from US firm, Birhle, to help the aircraft pull out of spins. This was achieved by shifting the horizontal fins and rudder further down the fuselage. Now mathematical modelling indicates the redesigned IJT is well equipped to handle spins. “HAL continued its R&D efforts and undertook modification of IJT aircraft based on extensive and comprehensive wind tunnel studies”, affirms HAL chief R Madhavan. “We will have to conduct at least another 200 test flights to validate the IJT, including its stall and spin characteristics. But we have built 13 aircraft already and we can finish this without undue delay,” says a senior HAL designer. 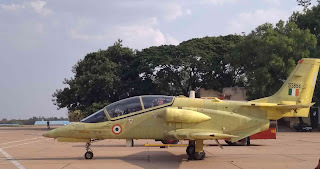 HAL designers also say many useful lessons have been learned from the development of the HTT-40 basic trainer. That expertise is now being fed back into the IJT. An example of this is the HTT-40’s modern all-glass cockpit, which will be retro-fitted into the IJT. In addition the safety equipment for stall and spin testing is being used in the HTT-40 and will be also used for the IJT. With the service life of the Kiran Mark II having recently been extended by four years, the IJT has that much time to enter service in numbers. An analysis of India’s March 27 anti-satellite (ASAT) test concludes that it was directed squarely at China, but would not deter Beijing from interfering with, or damaging, India’s satellite network in wartime. 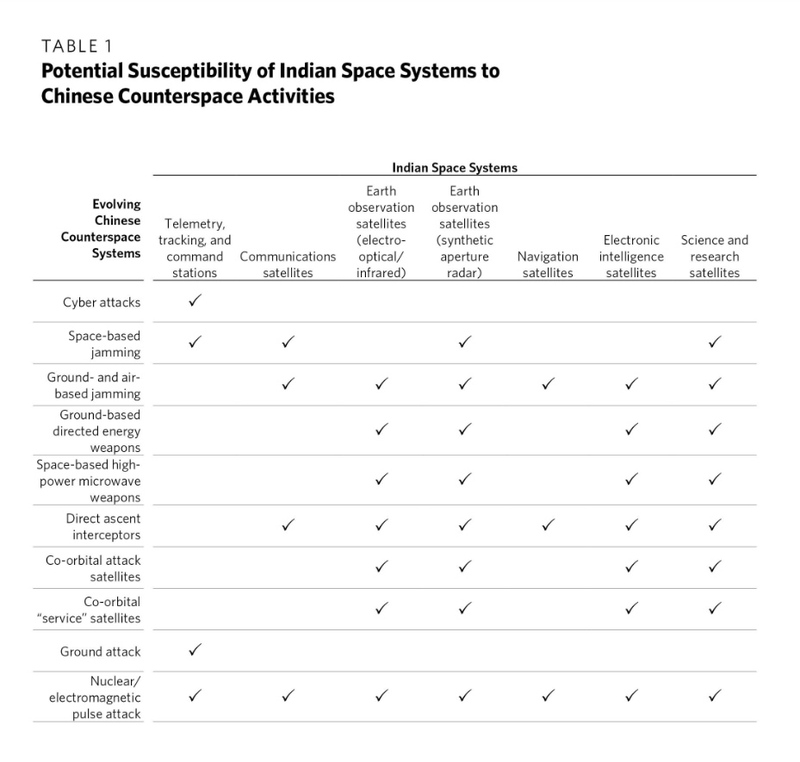 The report by Ashley Tellis, which the Carnegie Endowment for International Peace released on Tuesday, argues that, while India has demonstrated its ASAT interceptors can destroy Chinese satellites with kinetic (direct impact) strikes, Beijing’s highly sophisticated ASAT programme provides it with several non-kinetic options to disable Indian satellites without physically striking them. Beijing’s ASAT capabilities “include the capacity to mount sophisticated cyber attacks directed at [Indian] ground stations with the intent of either corrupting or hijacking the telemetry, tracking, and command systems used to control various spacecraft on orbit. They also involve huge investments in developing ground-, air-, and space-based radio frequency jammers that target the uplinks, downlinks, and crosslinks involved in either the control of space systems or the transmission of data arising from various space system activities,” says Tellis. Beijing began developing non-kinetic weapons to disable enemy satellites following widespread criticism of its ASAT test in January 2007, which created about 3,000 space debris that will constitute a hazard for decades. “Beijing has concentrated on developing… mainly low- and high-energy lasers, as well as space-based high power microwave systems as more usable alternatives. Low-energy lasers can dazzle or damage electro-optical or infrared sensors and would be particularly effective against India’s earth observation and scientific research spacecraft, most of which are located in low earth orbits,” says Tellis. “Ground-based high-energy lasers and space-based high-power microwave weapons on the other hand could, when successfully deployed, permanently destroy the electronic circuitry of various kinds of satellites without creating the unwanted debris usually associated with a physical collision. While such lasers would likely be most effective against satellites in low earth orbits, space-based high-power microwave weapons could target all kinds of space systems even in higher orbits,” he says. Beijing’s ambitious star wars programme also incorporates “service satellites” that do not smash into adversaries’ satellites, but push them off their trajectory or physically damage them with robotic arms. “Finally, China retains an impressive capability to target India’s master control facilities (and other nodes in its telemetry, tracking, and control network) through both space-based jamming and precision air and missile attacks, while also possessing the capacity to indiscriminately destroy India’s (and others’) space platforms through high-altitude nuclear explosions. Because the latter would put at risk both Chinese and adversary spacecraft simultaneously, it is unlikely that such operations would ever be preferred by Beijing when it has so many other less risky alternatives available,” says Tellis. 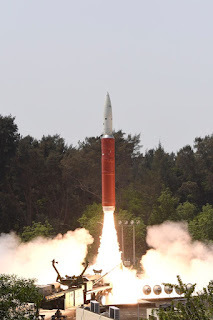 Consequently, “India’s kinetic ASAT system has important but limited value: it can deter kinetic strikes on India’s space systems, but this is the least likely eventuality because Beijing is already investing heavily in suppressing India’s (and others’) space systems through less destructive but comparably effective alternative instruments,” says the report. Meanwhile, China continues to develop kinetic “direct ascent interceptors” such as the SC-19 and its successor the DN-3, which provide “hit to kill” capabilities against adversaries’ high-value space platforms. 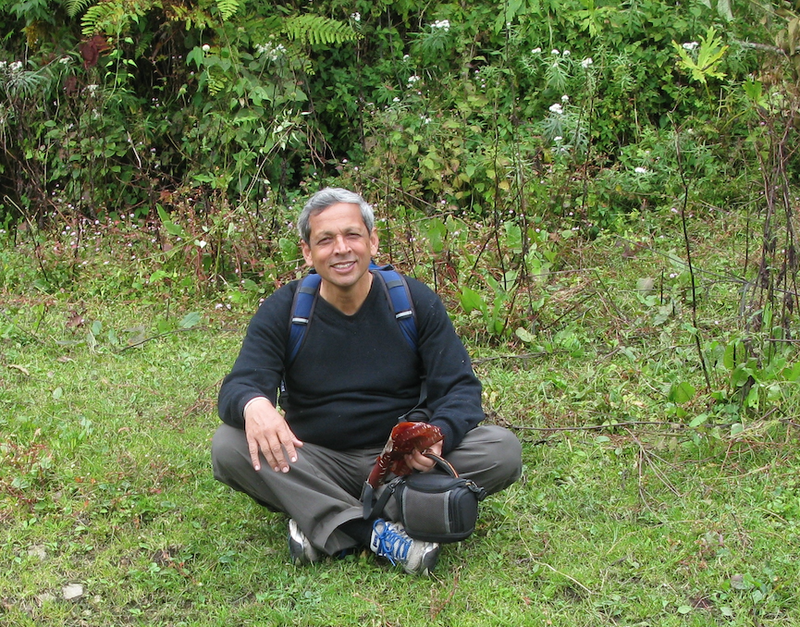 The Nirbhay test – its sixth developmental flight trial – was crucial, with three of its five previous firings having been unsuccessful to varying degrees. This test, however, was a complete success, says the Defence Research & Development Organisation (DRDO), which manages the Nirbhay project. L&T has designed the Nirbhay’s airframe, fuel tanks and foldable wings, as well as the entire launch system. Other private sector firms also have lesser roles. The Gas Turbine Research Establishment, a DRDO laboratory, is designing the Nirbhay’s engine. Launched from the Integrated Test Range in Chandipur, Odisha, the Nirbhay was required to skim the sea, just metres above the waves, and accurately navigate its way past a series of designated “way points”, spread out over 1,000 kilometres. This capability would, in wartime, allow the Nirbhay to follow a low-level path, undetected by enemy radar, and strike a target 1,000 kilometres away with extreme precision. Stealth is essential because the slow-flying missile is vulnerable to being shot down by fighter aircraft, if detected by enemy radar. “The missile took off vertically, turning horizontally into [the] desired direction, [the] booster separated, wing deployed, engine started, [and the missile] cruised [past] all the intended waypoints. The missile demonstrated its sea-skimming capability to cruise at very low altitudes,” said a defence ministry (MoD) release. The defence ministry says a chain of radars, electro-optical and telemetry systems along the eastern coast tracked and validated the Nirbay’s flight. More flight-testing lies ahead for the Nirbhay, which will eventually be fired from land, sea and airborne platforms. Army chief General Bipin Rawat commissioned Indian Coast Guard Ship (ICGS) Veera at Visakhapatnam, the third of seven OPVs that L&T is building at Kathupalli shipyard in Tamil Nadu. L&T won the Rs 1,304 crore CG contract to build seven OPVs in March, 2015. All three vessels delivered so far have been ahead of schedule. These OPVs are designed in-house, at L&T’s warship design centre at Manapakkam, Chennai, making it the first significant warship fully designed and built in private sector facilities. L&T is pushing hard to be also allowed to design and build larger warships like corvettes, frigates, and destroyers, but the MoD has so far given those contracts “on nomination” to the four public sector defence shipyards: Mazagon Dock, Mumbai; Garden Reach Shipbuilders & Engineers, Kolkata; Goa Shipyard Ltd and Hindustry Shipyard Ltd, Visakhapatnam. In addition, Cochin Shipyard Ltd, a state enterprise, is being “nominated” to build aircraft carriers for the navy. L&T is also pushing for the Project 75-I contract to build six conventional submarines, based on foreign technology, which the MoD proposes to tender under the strategic partner (SP) category. For this, L&T has an impressive track record, having built the hulls of India’s nuclear submarines at its Hazira facility. The 98-metre-long OPVs embark 106 crewmembers, who police India’s maritime zone on anti-smuggling and anti-piracy missions of up to 5,000 nautical miles (9,250 kilometres). The vessels can touch 26 knots (50 km per hour) and deploy a 30-millimetre main gun and two 12.7 mm heavy machine guns. The OPV also embarks a twin-engine helicopter and four high-speed boats for boarding operations. It is also equipped to respond to fires and oil and chemical spills. Five years after Christine Fair wrote Fighting to the End: The Pakistan Army’s Way of War, which attempted to decode the Pakistan Army’s strategic culture through a detailed study of its in-house publications, Fair has scoured the in-house literature of the Lashkar-e-Tayyaba(LeT) to arrive at how its members think and act in remaining the Pakistani “establishment’s” instrument of choice for cross border jihad. Her book is a deeply worrying look into the heart and sinews of a potent terrorist outfit that possesses the attributes needed to survive and flourish: unflinching state support, an institutionalised narrative of religion-based victimisation, strong support from a highly conservative populace, a steady flow of funds and a clear enemy. In Fighting to the End, Fair relied on the Pakistan Army Journal, periodicals from Pakistan’s military Staff College and National Defence University and the Pakistan Army Green Book, an annual compilation of articles by Pakistani military officers. For this book, the author has mined a trove of materials including books, pamphlets, calendars and periodicals put out by the LeT’s exclusive publisher, Dar-ul-Andlus,nearly one thousand shaheed(martyr) biographies of LeT fighters who were killed while waging jihadin Kashmir, and the author’s personal materials collected during her numerous trips to Pakistan between 1995-2013. Fair writes that the Pakistan military’s Inter-Services Intelligence (ISI) blacklisted her in 2013, which prevented her from ever returning to Pakistan. While this book provides a revealing and comprehensive guide to the broader jihadi landscape in Pakistan, its intense focus on the LeT is especially interesting. In an analytical arena where scholars’ perceptions and conclusions have been too often based on anecdotal evidence, Fair’s reliance on LeT publications comprises a more rigorous methodology. Her empirical analysis, drawn from hundreds of data cases, often upturns established tenets on jihadi groups, their sources of recruitment and their organisational principles. The author convincingly underlines the unique, symbiotic relationship between Pakistan’s military and the LeT. Since Pakistan’s many Deobandi groups, such as the Jaish-e-Mohammed, Harkat-ul-Ansar and Harkat-ul-Mujahideen, draw resources from the wealthy Deobandi mosque networks and political influence from the Deobandi Jamiat-e-Ulema-e-Islam(JUI) political party, they are more independent from the ISI (which manages jihadi groups on behalf of the army). In contrast, the LeT has a far smaller resource base, since it draws on the Ahl-e-Hadeesinterpretation of Islam that is followed by just four per cent of Pakistan’s populace. Further, the Ahl-e-Hadees adherents are far from united, with serious disagreements over issues like jihad. That leaves the LeT with access to only a limited pool of domestic resources, leaving it dependent on the ISI that controls it tightly. Deobandi groups, especially those in the Tehrik-e-Taliban Pakistan (TTP) can engage in takfir– holding their rulers responsible for deviating from Islamic principles. However the ISI makes sure the LeT’s jihad never focuses inwards. The LeT can kill Hindus, Christians and Jews outside Pakistan, as during the 26/11 Mumbai terror attacks, but doing so within Pakistan would create disturbances and instability. Therefore, apostates in Pakistan are to be won over with tarbiyat(education) and dawa(proselytization). The most convincing parts of the book relate to the data mined from the shaheedbiographies. It reveals that 98.9 per cent of LeT militants fight in Kashmir, with just a handful engaged in Afghanistan, Tajikistan and Bosnia-Chechnya. The LeT fighters die, on average, when they are 21 years old, but by then have already served the group for four years. Postulating that the LeT provides the Pakistan Army with low-cost manpower to fight India deniably, Fair compares the terms of service of an LeT militant with those of a Pakistani soldier. Most LeT fighters complete the Daura-e-Khaas course, by which time they would have trained for 16 weeks. A Pakistani soldier trains for 36 weeks. Then he serves for 15 years, drawing salary and later pension. 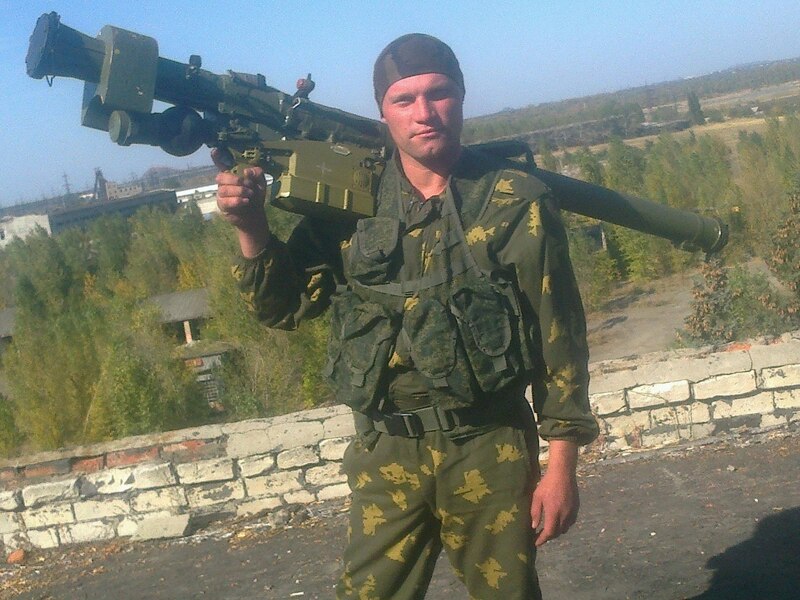 A LeT militant’s goal is not to retire with benefits but to die in combat. Thereafter, his family receives far less compensation than what the government pays the family of deceased soldiers. Despite Fair’s rigorous research, the book allows in occasional errors of fact and interpretation. One example is her explanation for why the LeT activated militancy in Poonch and Rajouri in the mid-1990s. She ascribes this to LeT recruits sharing ethnic linkages with locals in those areas, which would allow them to operate there easily. In fact, the local populace consists mainly of Poonchis, Paharis, Gujjars, Bakarwals and Dogra Rajputs (both Hindu and Muslim). These groups contribute only marginally to LeT recruitment, which is drawn mainly from Punjab. The author also cites the intention to target a larger Hindu populace in Poonch-Rajauri, perhaps even replicate the ethnic cleansing of Kashmiri Pandits from the Srinagar valley in the early 1990s. In fact, there are almost no Kashmiri Pandits in Poonch and Rajauri, which are part of the Jammu region, not Kashmir. Finally, the record shows there was never any significant Hindu migration from those areas. The reality is that the ISI activated insurgency in Jammu after the mid-1990s because its fighters in Kashmir were under severe military pressure. 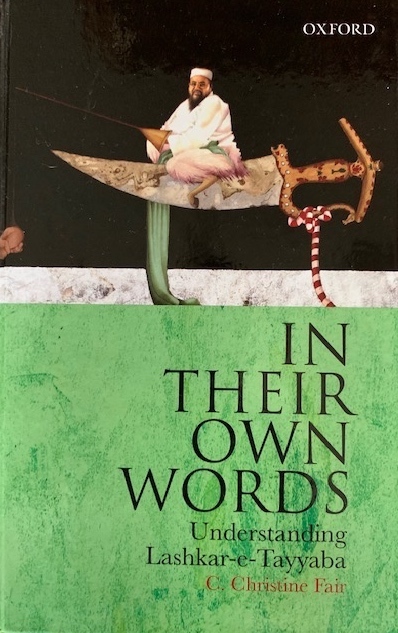 Notwithstanding minor errors, the author melds her vast experience in South Asia, her skills in Urdu and a penchant for empirical research into a very readable account of the LeT. This book must find a place on every South Asia specialist’s bookshelf. A final benefit for most readers would be an introduction to several new words: in one single paragraph of this book, I encountered “gasconading” (boasting extravagantly) and “prated” (engaged in empty talk). If you haven’t guessed it already, Fair was talking about Zulfiqar Ali Bhutto. The SP model of procurement, which was promulgated in outline in May 2017, envisages Indian companies manufacturing four categories of weaponry – fighters, helicopters, submarines and armoured vehicles – from design blueprints provided by selected foreign vendors. Without implementation guidelines for choosing an SP for building aircraft, the MoD cannot issue a formal tender – also termed request for proposals (RFP) – for the 114-fighter procurement. Meanwhile, seven international fighter manufacturers have responded to the RFI. Twosingle-engine fighters have been offered: Lockheed Martin’s F-16 Block 70 (which it has renamed F-21) and Saab’s Gripen E.
In addition, five vendors have offered twin-engine fighters: Dassault’s Rafale; Eurofighter’s Typhoon; Boeing’s F/A-18E/F Super Hornet and two Russian fighters: Sukhoi-35 and MiG-35. Like the 126-fighter tender issued in 2007 and eventually abandoned in 2015, this 114-fighter procurement expects to galvanize the domestic aerospace industry. Proceeding in parallel, with the same aim, is the so-called “Avro replacement project”. This envisages a private sector Indian manufacturer – Tata Advanced Systems Ltd (TASL) has been chosen – partnering Airbus to build the C295 medium transport aircraft in India to replace the obsolescent HS-748 Avro. At the Aero India 2019 expo in February, both Sitharaman and the air chief, Air Chief Marshal BS Dhanoa, mentioned the C295 as a “transformative” project. While both the 114-fighter and C295 projects involve manufacturing in India to foreign blueprints, Sitharaman also “asked the IAF to look at the future with the latest technologies available across the world and those that can be developed within India, in order to meet its needs”, according to the MoD. This would require shifting emphasis from licensed manufacture to indigenous aircraft development, such as the Defence R&D Organisation’s Tejas fighter and the futuristic advanced medium combat aircraft (AMCA). Technology development and absorption are also achievable through co-design and development such as the Indo-Russian Fifth Generation Fighter Aircraft project and the Future Generation Tempest project in the UK. However, the MoD has backed away from the former and not yet responded to the latter.